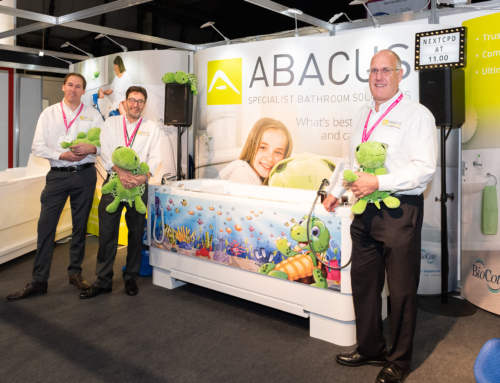 Andrew Williams, Bob Gibbs and Jon Nock representing Abacus Specialist Bathroom Solutions have successfully completed the British 10k in London to raise funds for the Young Epilepsy charity. Starting at Wellington Arch, our team ran in sweltering conditions past several famous landmarks including Big Ben, Westminster Abbey and finishing next to Trafalgar Square. They ran to raise donations for the Young Epilepsy charity which tackles epilepsy with children and young people across the UK. It delivers world class diagnosis, assessment and rehabilitation as well as pioneering research, specialist education, a helpline and national outreach services. We supply and support a power-assisted Gemini height adjustable platform bath at its specialist educational campus in Lingfield, Surrey. Out of 15,000 entrants, official results show Jon finished in 1,743th place with a time of 00:50:38, Andy crossed the line in 3,214th place on 00:55:50 and Bob finished at 00:55:51 and in 3,220th place.